Robin’s birthday was on Tuesday, and he wanted to treat himself to a cake. Specifically, a Black Forest Gateau. And he wanted a real one – none of this Paleo or low-carb or gluten-free nonsense, but something with real sugar and real flour. So he found himself a recipe and made the cake on Saturday. It’s not the recipe he’s used in the past, which called for simmering the cherries with arrowroot to make a gloopy sauce. It never worked. 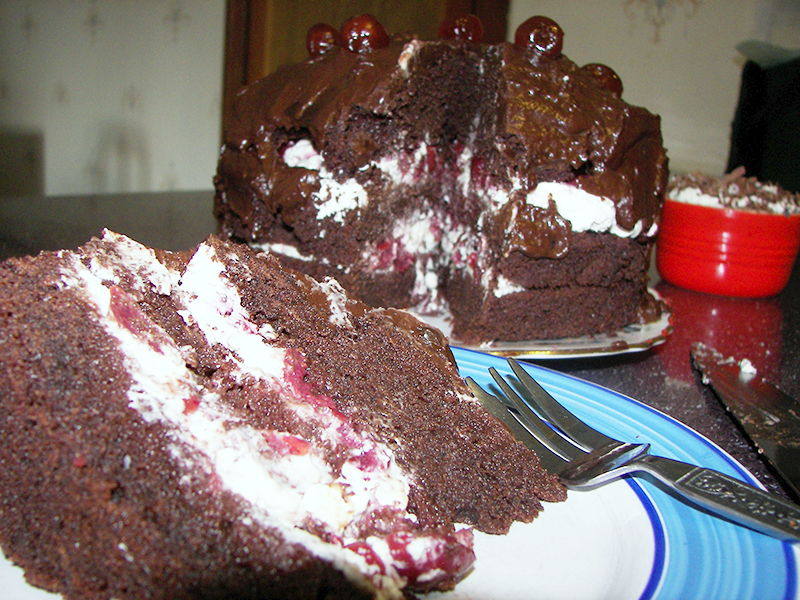 This one just has the cherries and whipped cream between each layer of cake. It also calls for kirsch, which strictly speaking is a kind of cherry schnapps. 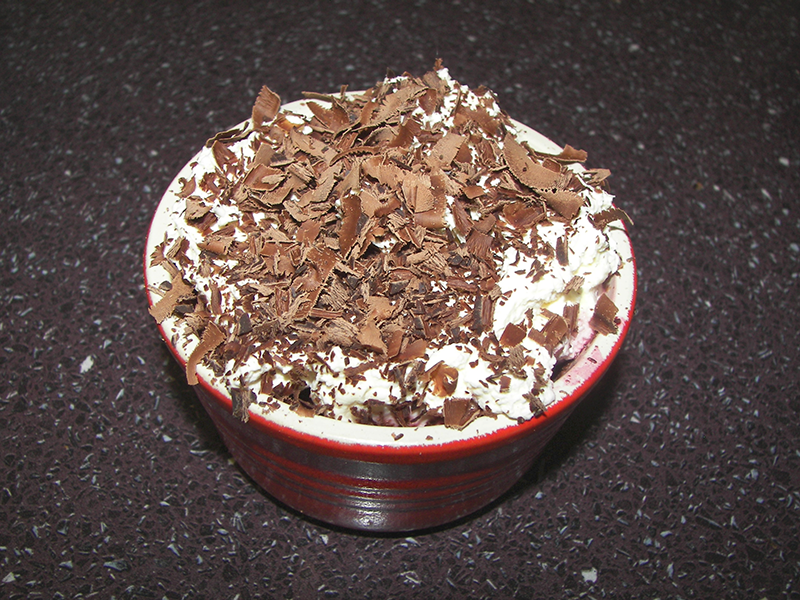 It comes from the Black Forest, which is what makes it a Black Forest gateau. I couldn’t find any of this, and we ended up with ‘cherry brandy’, which is basically ordinary brandy with cherries in – not the same thing at all, but it seemed to work. Since I’m currently quite strictly gluten-free, I couldn’t have any. So I wouldn’t feel left out, I thought I’d make myself something similar with some of his makings. So I made a cheesecake-type base with a handful of almonds, ground in the mini food processor, and fried for a few minutes in a generous slice of butter. At Robin’s suggestion (and he was right) I added some ground ginger. 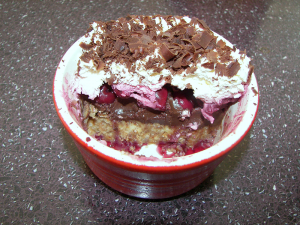 I patted this into the bottom of a large ramekin disk and put it in the fridge to cool. 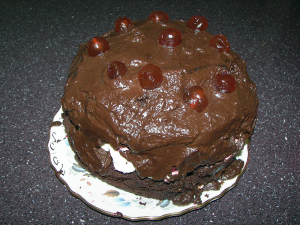 Robin was making a chocolate cream icing, made simply of dark chocolate and cream. I helped myself to a spoonful of this and spread it over the nutcrumb base. On top of that went about a dozen Morello cherries and a little of the syrup they came in, mixed with a drop of the cherry brandy. 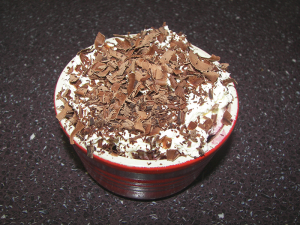 Then I spread some of the whipped cream over that and topped it with chocolate shavings. Meanwhile Robin sandwiched his cake together, iced it with the rest of the chocolate cream icing, and put glacé cherries on top – not in the recipe but he’s fond of them. What I ended up with was something that would probably qualify as lacto-paleo. Other than the syrup from the cherries, and what’s in the dark chocolate, there’s no sugar in it. You could make it more paleo by using fresh cherries rather than ones from a syrupy jar, and if you’re not ok with dairy then coconut butter and coconut milk usually make good substitutes. But I’ve not tested this. I have Robin’s word for it that his cake is delicious. Which is good because he has to eat the whole thing, and it’s quite a monster. The cake part he says is particularly good as it has more cocoa in it than most chocolate cakes, making it lovely and rich. And my little pot was absolutely divine. 3 Responses to "Black Forest Gateau"
I think your little pot sounds nicer than Robin’s whole cake, to be perfectly honest! I am seldom a fan of chocolate cake, although I love a plain sponge. If you can get buckwheat flour where you live, or if you go to France you can get it there, then do. Or, failing that, soya flour (gram flour) is widely available. Both make the most delicious pancakes and are totally gluten-free. Nearest Waitrose is in Edinburgh. Nice thought though!